Give Orange is April 9-10, 2019! In 2018, more than 77 heroes gave more than $73,000 to the Give Orange Challenge Fund to help double gifts from the Cowboy family during Give Orange. These passion-igniting donors inspired gifts to 55 campus units and paved the way for a record-breaking Give Orange that raised $610,227. We cannot wait to see what you can do in 2019. 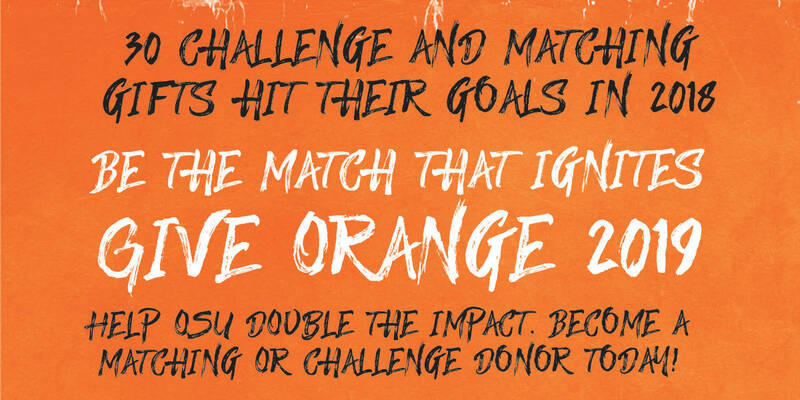 On April 9-10, 2019 for 1,890 minutes - or 31.5 hours - the Give Orange Challenge Fund will be used to amplify participation through challenge and matching gifts to inspire the Cowboy family to make this one of OSU's biggest moments in 2018. Make Your Own Challenge - Once you press Give Now, you can tell us more about where you would like to designate your gift. A member of our team will connect with you to work out all the fun details regarding how your gift can inspire others. Let Our Team Get Creative - All undesignated gifts through this year's Give Orange Challenge Fund will be used creatively to inspire participation through fun leaderboards and challenges that energize the day. Email Anna McCrarey (amccrarey@osugiving.com) or call at 405-385-5178.